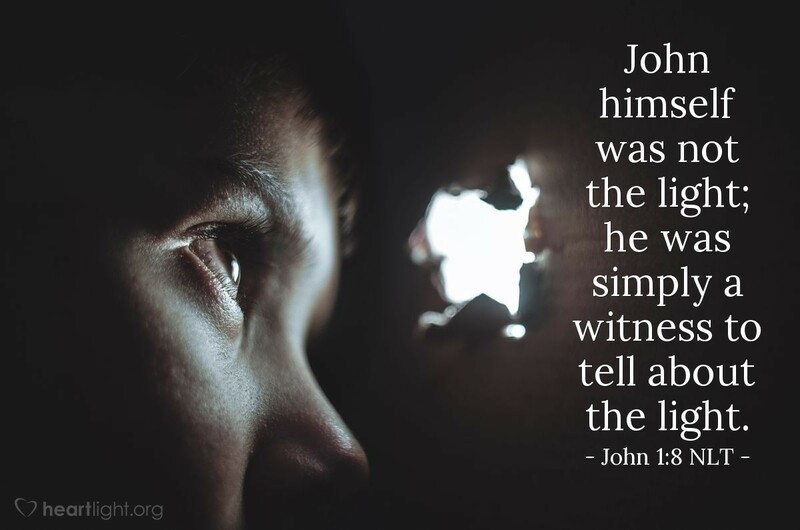 John himself was not the light; he was simply a witness to tell about the light. John the Baptizer was an incredible man. He was a prophet, inspired by God's Spirit. He spoke with an authority and authenticity long silent among God's people. He courageously declared the truth to everyone no matter that person's rank and no matter his own personal cost. But ... John was only a witness to God's light — Jesus, God's real Word and only Son. And as important as John may have been, his importance was as a servant to the light. John freely testified to this function (John 1:15). He knew his role. He refused to be a point of contention. He is a great example to us of what we can and should be to our loved ones and friends — a witness, someone who points others to the truth and light of Jesus. Thank you, Heavenly Father, for John the Baptizer. Thank you for such a powerful example and such a wonderful person of integrity. Please use me to point those in my influence to the truth about Jesus as I seek to live with integrity before them. In the name of the Lord Jesus, I pray. Amen.